Design and Install replacement lighting and lighting controls. This was a Design-Build project issued by the US Army Corps of Engineers as a Task Order under our Energy MATOC managed by the Huntsville Engineering Support Center. 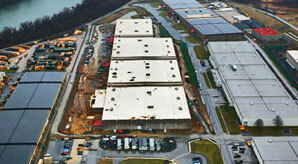 Our scope of work included installing replacement lighting for three active warehouses totaling 610,629 sf. Specifically LEI replaced existing high pressure sodium and metal halide lighting fixtures in high bay storage areas with high bay fluorescent, energy efficient T5HO fixtures with passive infrared occupancy sensors. LEI also replaced 11 power distribution panels in WWII warehouse, performed pre-construction and post construction energy measurement and verification at each 30 day period and performed commissioning on all systems. In addition, all warehouses were active, functioning facilities with priority military support missions which could not be disrupted or interrupted, including one warehouse which was a secure facility requiring escorted access.